Phenol red (also known as phenolsulfonphthalein or PSP) is a pH indicator frequently used in cell biology laboratories. Phenol red exists as a red crystal that is stable in air. Its solubility is 0.77 grams per liter (g/l) in water and 2.9 g/l in ethanol. It is a weak acid with pKa = 8.00 at 20 °C (68 °F). A solution of phenol red is used as a pH indicator: its color exhibits a gradual transition from yellow to red over the pH range 6.8 to 8.2. Above pH 8.2, phenol red turns a bright pink (fuchsia) color. This solution contains a pH indicator which helps in monitoring of the pH changes in the cell culture. 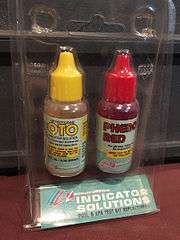 It will change from red to yellow when the pH value decreases. and is orange-red. If the pH is increased (pKa = 1.2), the proton from the ketone group is lost, resulting in the yellow, negatively charged ion denoted as HPS−. At still higher pH (pKa = 7.7), the phenol's hydroxide group loses its proton, resulting in the red ion denoted as PS2−. In several sources, the structure of phenol red is shown with the sulfur atom being part of a cyclic group, similar to the structure of phenolphthalein. However, this cyclic structure could not be confirmed by X-ray crystallography. Phenol red was used in the phenolsulfonphthalein test to estimate the overall blood flow through the kidney and is now obsolete. The test is based on the fact that phenol red is excreted almost entirely in the urine. Phenol red solution is administered intravenously, the urine produced is collected. By measuring the amount of phenol red excreted colorimetrically, kidney function can be determined. 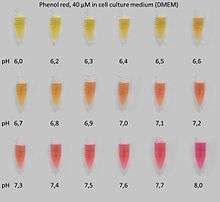 Phenol red, 40 µM: colors in cell culture medium at a pH range from 6.0 to 8.0. Most living tissues prosper at a near-neutral pH; that is, a pH close to 7. The pH of blood ranges from 7.35 to 7.45, for instance. When cells are grown in tissue culture, the medium in which they grow is held close to this physiological pH. A small amount of phenol red added to this growth medium will have a pink-red color under normal conditions. Typically, 15 mg/l are used for cell culture. In the event of problems, waste products produced by dying cells or overgrowth of contaminants will cause a change in pH, leading to a change in indicator color. For example, a culture of relatively slowly dividing mammalian cells can be quickly overgrown by bacterial contamination. This usually results in an acidification of the medium, turning it yellow. Many biologists find this a convenient way to rapidly check on the health of tissue cultures. In addition, the waste products produced by the mammalian cells themselves will slowly decrease the pH, gradually turning the solution orange and then yellow. This color change is an indication that even in the absence of contamination, the medium needs to be replaced (generally, this should be done before the medium has turned completely orange). Since the color of phenol red can interfere with some spectrophotometric and fluorescent assays, many types of tissue culture media are also available without phenol red. 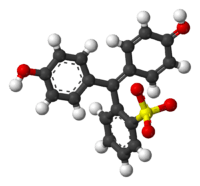 Phenol red is a weak estrogen mimic, and in cell cultures can enhance the growth of cells that express the estrogen receptor. An important breakthrough in biotechnology was reported in 2005 by Bukovsky and coworkers. Using phenol red as a differentiation factor, they produced human oocytes (eggs) from cells scraped from the surface of adult ovaries. These cells on the outer ovarian surface are known as ovarian surface epithelial cells. Such cells had been taken from five women aged 39 to 52 and were cultured in the presence of phenol red, inducing oogenesis. Previously, human eggs had only been produced in vitro from totipotent, blastomeric embryonic stem cells. This experiment demonstrated viable human egg cells can easily be produced from an adult cell that already has some degree of specialization. Furthermore, it lessens the implications associated with the fact that women are born with all of the egg cells they will ever have throughout their lives. While this breakthrough was not without controversy, it provides hope for infertile women wishing to undergo in vitro fertilization, and hints at the possibility of new options for postmenopausal women, as well. It also suggests the future of stem cell research may not have to rely as heavily on human embryos as a source of unspecialized, totipotent cells for research. Phenol red, sometimes labelled with a different name, such as "Guardex Solution #2", is used as a pH indicator in home swimming pool test kits. Chlorine can result in the bleaching of the dye in the absence of thiosulfate to inhibit the oxidizing chlorine. High levels of bromine can convert phenol red to bromophenol red (dibromophenolsulfonephthalein, whose lowered pKa results in an indicator with a range shifted in the acidic direction - water at pH 6.8 will appear to test at 7.5). Even higher levels of bromine (>20 ppm) can result in the secondary conversion of bromophenol red to bromophenol blue with an even lower pKa, erroneously giving the impression that the water has an extremely high pH despite being dangerously low. ↑ Tamura, Z.; Maeda M. (1997). "Differences between phthaleins and sulfonphthaleins". Yakugaku Zasshi (in Japanese). 117 (10–11): 764–770. PMID 9414589. ↑ Yamaguchi, K.; Tamura, Z.; Maeda, M. (1997). "Molecular Structure of the Zwitterionic Form of Phenolsulfonphthalein" (pdf). Analytical Sciences. 13 (3): 521–522. doi:10.2116/analsci.13.521. ↑ "Phenolsulfonphthalein Test". Encyclopædia Britannica. ↑ Berthois, Y.; Katzenellenbogen, J. A.; Katzenellenbogen, B. S. (1986). "Phenol red in tissue culture media is a weak estrogen: Implications concerning the study of estrogen-responsive cells in culture" (pdf). Proceedings of the National Academy of Sciences of the United States of America. 83 (8): 2496–2500. doi:10.1073/pnas.83.8.2496. PMC 323325 . PMID 3458212. ↑ Bukovsky, A.; Svetlikova, M.; Caudle, M. R. (2005). "Oogenesis in Cultures Derived from Adult Human Ovaries" (pdf). Reproductive Biology and Endocrinology. 3 (5): 17. doi:10.1186/1477-7827-3-17. PMC 1131924 . PMID 15871747.